Access and control keyboard-video-mouse functions of 4 remote computers from one box with four local HDMI monitors. 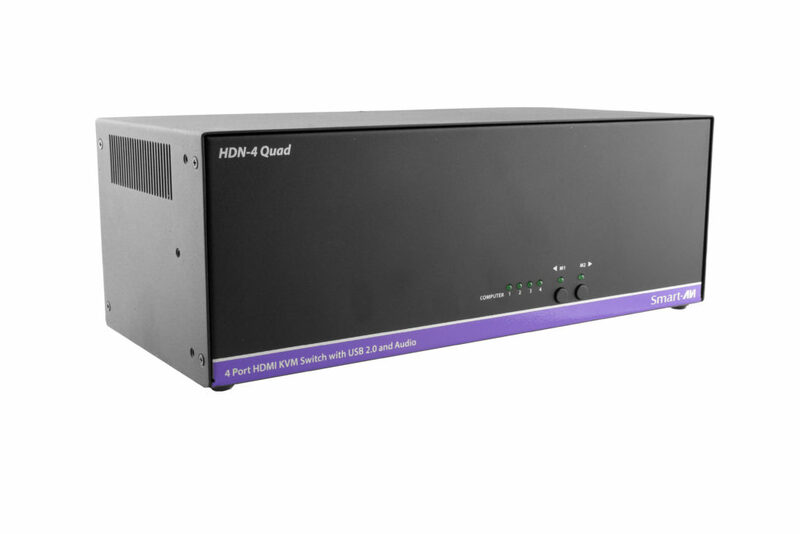 The HDN-4Quad is a 4-port KVM switch with quad-head HDMI video connectors; supports video up to 4K (3840x2160 @30Hz) Full HD resolution. How does the HDN-4Quad Work? 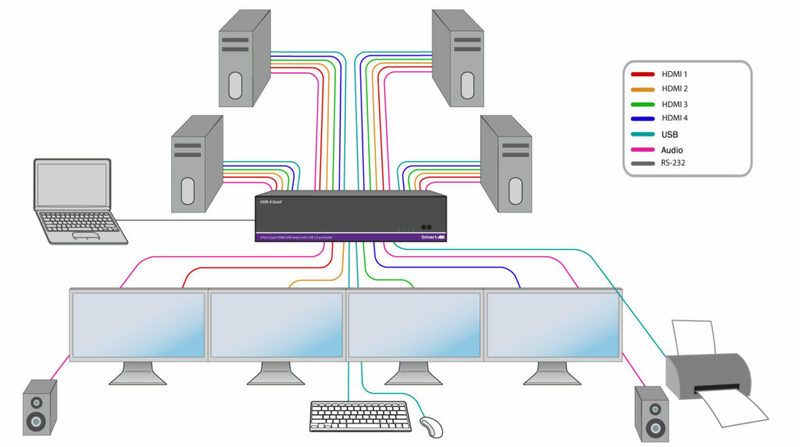 The HDN-4Quad allows users to easily access, control, and switch between 4 remotely connected computers from one convenient central PC workstation. 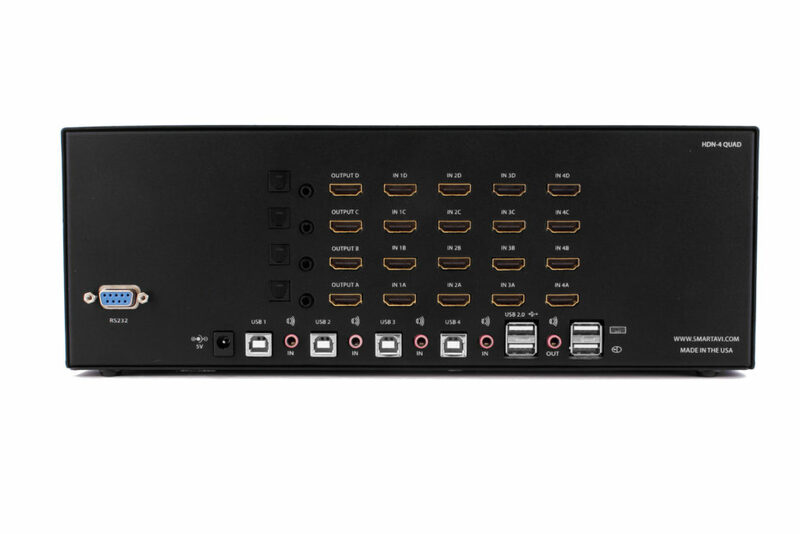 Outfitted with quad-head HDMI video connectors, the HDN-4Quad supports video from remote desktops on up to 4 local displays simultaneously, which is perfect for supervising workflow and monitoring operations. Front Panel Buttons: Two simple source selection buttons that make it easy to switch between different computers. USB Keyboard Hotkey Commands: Simple hotkey commands over PC that offer more robust control of the HDN-4Quad. 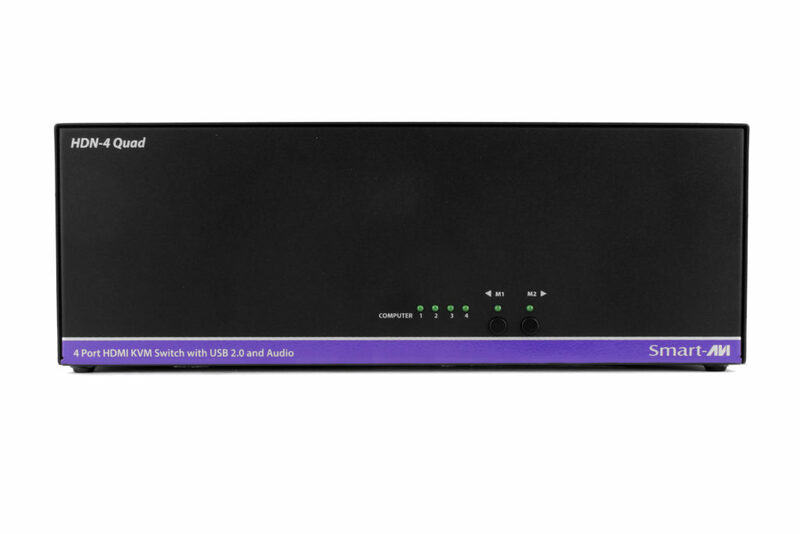 TCP/IP Web Console: Connect to an optional online interface that offers full visual command of the HDN-4Quad's switching functions. Perfect for monitoring and managing operations on multiple remote computers, the HDN-4Quad excels in all kinds of environments including data centers, industrial control rooms, transportation hubs, educational facilities, and more! Supports all USB 2.0 devices (keyboard, mouse, peripherals). Quad-head HDMI connectors for up to 4 local monitors. Up to 4K (3840x2160 @30Hz) Full HD Resolution emulation. Plug-and-Play: easy to install & use!